An abrupt genre shift from my last review, The Court of Dreams goes for the markedly more amusing subgenre of comic fantasy. My personal view is that comic fantasy is the hardest subgenre to pull off: when done well, it's hilarious - but much of it is trite or just unfunny. It's easy to slip up. The Court of Dreams goes for the route which I have a slight preference for: humour through writing and character, rather than world (a setting where worldbuilding is based entirely upon amusement value and how many puns can be obtained thereby often comes off as pointless). 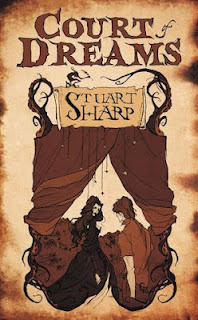 From the first chapter, which introduces Grave, it's easy to see that Sharp is aiming for a style squarely between Pratchett and Rankin - witty and frequently absurd. What's more surprising is that - generally speaking - he succeeds, and Court of Dreams is one of those few genuinely funny comic fantasies. Don't judge it from the first chapter, however: the initial two pages suffer slightly from trying too hard for the style I mentioned, and while they manage it, the constant Pratchett-style digressions are distracting. Thankfully, the novel soon sticks with a more soberly comic tone. And it works well. An urban fantasy partially set in a secondary world, the titular Court of Dreams, the novel follows a pair of students - well, finishing students (don't be picky or I'll settle on 'whippersnappers') - as they're drawn into the eponymous Court. When Thomas Greene witnesses a murder - or, by Grave's insisistent terminology a hunt - he becomes rather a liability to the Court's scheming Princess, Siobhan - so naturally, Grave (the Court's huntsman) is ordered to dispose of him. Greene, who happens to be breaking up with his girlfriend Nicola at the time, seems curiously averse: and when the assassination attempt goes awry, it catapults both into the Court of Dreams. Which, of course, is utterly bizarre and frequently attempts to eat them. This is urban fantasy, after all. From the nature of the Court, you might well expect the setting to be utterly incomprehensible. Not so. It is, as I've mentioned, bizarre at times - but on the whole, it's a fairly clear setting, and the novel benefits immensely from this. Thomas is a convincingly sympathetic protagonist, though not hilarious in and of himself: it's generally the narration that provides the comedy value here, as the plot is fairly sober (coups, chases, and rather large Wars - capital included - feature prominently). On the other hand, Nicola - while appreciable - is a little less sympathetic than Thomas: she's not as strong a female character as some, and has a tendancy to randomly blame him. Thankfully, she's counteracted by Melissa, who's entirely more reasonable. And Grave, who isn't (but is much funnier). It's an interesting cast, and most aren't particularly humorously by themselves - the comedy comes through combination and narration. And to be honest, I like that. A frequent problem with comic fantasy is pointlessness: if the world is just a cosmic joke waiting for the author's punchline, how are we meant to take anything seriously? Maybe we're not, in some - but most try for a range of tones. Court of Dreams thankfully avoids this by infusing humour into the plot and setting, rather than relying on comedy inherent in them. Some twists you'll see coming. Siobhan is hardly a sympathetic antagonist. But despite any flaws The Court of Dreams may have, it's an engagingly fun piece - not always laugh-out-loud funny, but at least look-weird-by-grinning-at-your-book amusing throughout! Getting a tone partway between Pratchett and Rankin, though slightly quieter than either in narration, The Court of Dreams is short, fast-paced, and well worth picking up.